Fulfilling Phil Chess’s prophecy, Chuck Berry returned to Chess Records in 1969 after a three year stay with Mercury Records. And it was like he never left, as his very first session produced a great two-sided single, “Tulane” b/w “Have Mercy Judge.” The record didn’t chart, but it was obvious that Chuck was truly “back home” (as his first album back on Chess was called) and already producing high quality “Chess” recordings once again. This third and last 4 CD set of Chuck Berry’s Chess recordings collects every available master and alternate from “Tulane” till the label shuttered its doors to recording new music. 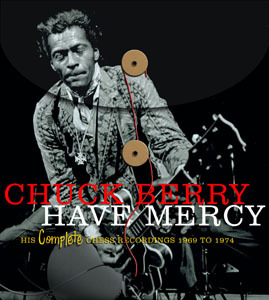 The 71 tracks here include his only #1 (“My Ding-A-Ling (live)”), plus 22 previously unreleased recordings, ranging from cool in-studio jams/instrumentals (“Turn On The House Lights,” “Rockin’”) to 4 additional live recordings from the smoking concert that produced the live side of The London Chuck Berry Sessions; from an intimate, small group session in October of 1972 which produced two throwback “Chuck blues” tracks, “Blues #1” and “Annie Lou,” to Chuck’s renditions of “Jambalaya” and “Dust My Broom.” There’s also a live version of “South Of The Border” only previously released as a “B” side in the U.K. and the hot concert London Sessions performance of “Roll ‘Em Pete,” also originally only released in edited form as a “B” side with a different rhythm section dubbed in - this set has both the complete original and single versions. As with the two earlier volumes, Have Mercy includes liner notes by Berry biographer (and the set’s co-compiler) Fred Rothwell, great period photos and graphics, as well as complete session-by-session credits. ** Previously Unreleased in U.S.
Chuck Berry's UK Tour has been cancelled. Most venues are offering refunds by now.